Join us on April 28 for Yoga Reaches Out, a day-long yogathon that harnesses the power of our community to help families and sick children. Your gift to the Every Child Fund goes where funds are needed most—programs that help children heal, support families, and fund research. help give every child a healthy future, and WALK with us on Sunday, June 9. Join us for Kidding Around on May 16. 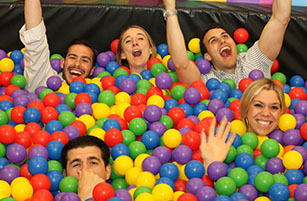 Enjoy Larger-than-life games, kids’ menu-inspired food and crazy fun cocktails—the last time you had this much fun you had a curfew!